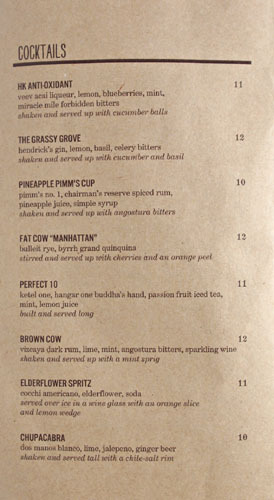 Hot on the heels of my surprisingly good visit to the new Gordon Ramsay Steak is the unfortunately-named Fat Cow, Gordo's newest venture set in The Grove. 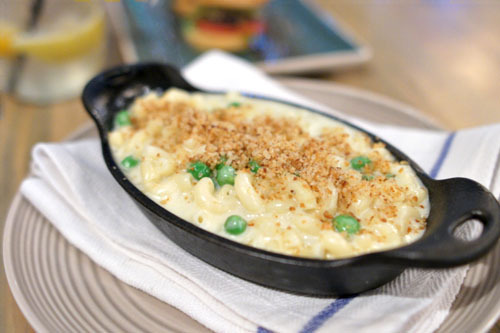 The restaurant is one of the most widely anticipated debuts of the year, and is yet another gastropub-y concept to hit LA. Word is that, early on, GR Steak's Chef Kevin Hee was supposed to have a significant role in opening the place, but ended up being forced out by investors, which also resulted in the departure of Hell's Kitchen Sous Chef (and GR Holdings Corporate Executive US Chef) Andi Van Willigan (remember, they were both part of the Mina group for several years). With all the chef shuffles, the kitchen is now helmed by one Mathew Woolf, late of West Restaurant & Lounge. About the Chef: Woolf was born and raised in the UK, and the Chef was exposed at a young age to the benefits of good eating, as his grandparents ran a produce shop that supplied some of the best kitchens in London. He began his professional culinary career at age 16, when he took on a dishwasher role at The Ship Inn in Burnham-on-Crouch, Essex; just eight months later, he was promoted to head chef. During this period, he also attended culinary school at the Hospitality Plus College of Catering in Chelmsford, graduating in 2000. From there, Woolf became demi-chef de partie at the famed Claridge's Hotel in London, working under Chef John Williams. In October 2004, he followed Williams to The Ritz Hotel, where he served as Sous Chef, staying there until the end of 2007. The next year, Woolf moved to the United States to cook at Sixteen Restaurant at Trump international Hotel and Tower in Chicago, a gig that lasted until August 2009. 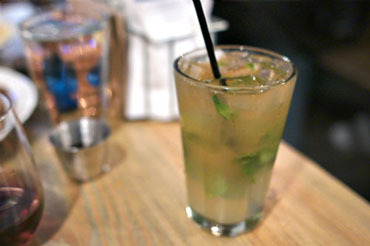 In 2010, he relocated to the West Coast, landing a Chef de Cuisine role at Ray Garcia's FIG Restaurant at the Fairmont. The following August, Woolf secured his first Executive Chef position, taking the reins at West Restaurant and Lounge at the Hotel Angeleno, a role that he would keep for a year before finally decamping to helm The Fat Cow. 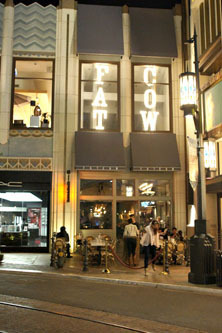 The Fat Cow takes over the spot formerly held by the mediocre Farm of Beverly Hills. The space has be redone by AK Design Network, and is described by marketing materials as an American "roadhouse" eatery. As is par for the course these days, the aesthetic aims for warmth and rusticity, but with an industrial-country-chic type panache. Naturally, communal dining tables are utilized to full effect here, as are reclaimed wood, Edison bulbs, and other various vintage, eclectic touches. 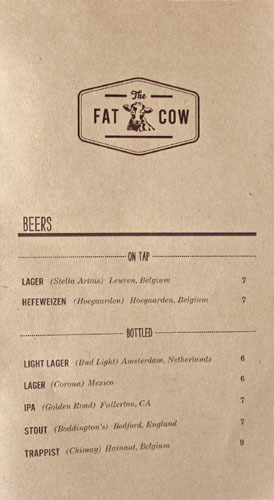 The Fat Cow's menu, like many others these days, takes a "classic-yet-modern" approach to cooking, featuring traditional comfort food stylings, but hopefully taken up a notch. 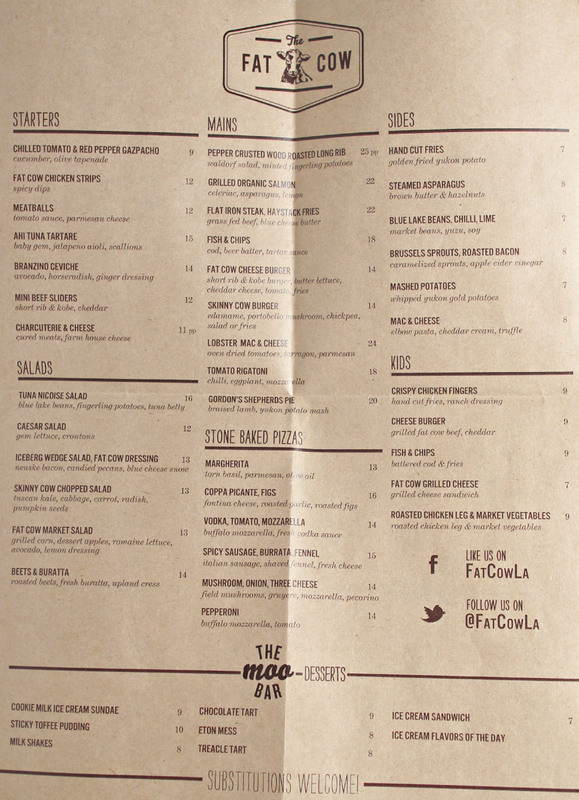 There's even a children's menu (usually not a good sign), while the Moo Bar up front handles the old-timey desserts (and will eventually offer to-go items as well). Click for a larger version. 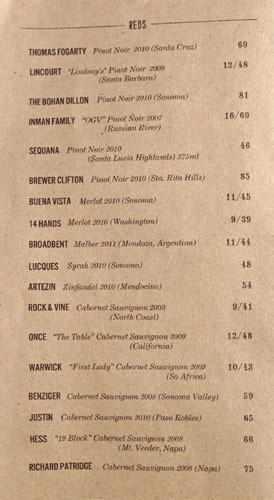 To drink, there's a full bar available, in addition to a small selection of beers and Cali-centric wines. Click for larger versions. As usual these days, a trio of cocktails marked the start of our meal. 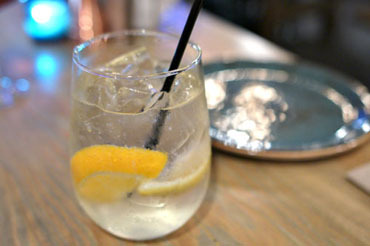 I went with the Elderflower Spritz, which I found to be a great summer quaffer: fruity and floral in essence, with a lively carbonation. 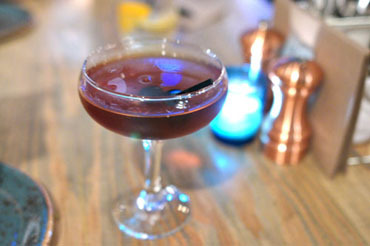 On the other end of the spectrum was the Fat Cow's version of a Manhattan, which was also quite delicious, with a classic, yet contemporary character and a good balance of spicy fruit over the base of rye. Last up was the Chupacabra--no slouch either. This one played the aggressiveness of the agave nicely against the contrasting tartness of citrus and ginger, all while the chile-salt rim added a well-placed piquancy to things. 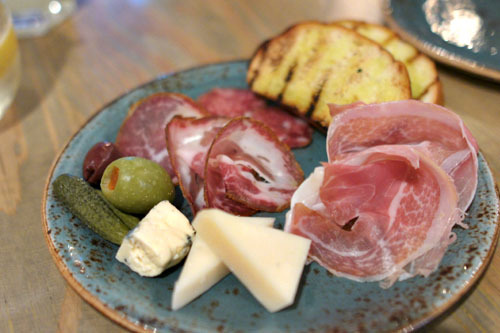 A cheese and charcuterie plate brought together tasty cuts of coppa, prosciutto, and salami on the meat side, along with two cheeses: a Lamb Chopper blue from California and one that unfortunately I didn't catch the name of (though it was quite tasty--creamy, nutty, and subtle). 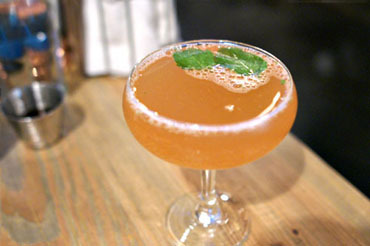 The gazpacho was a refreshing jolt to the palate: summer-y and bright, with a lovely mix of tangy and spicy flavors. 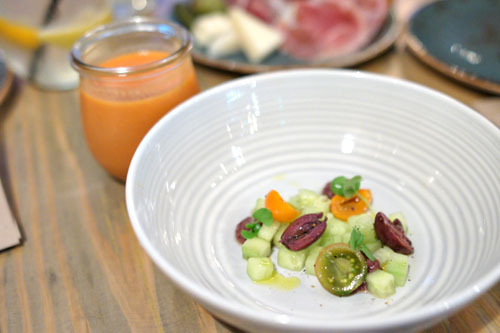 I also appreciated the weight of the olive here, while the cucumber imparted a great crunch and lightness to the dish. A ceviche came out more like a crudo. 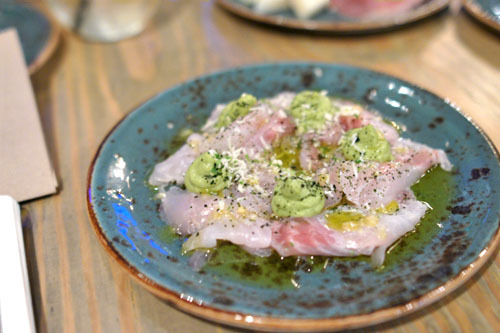 The use of avocado here added a significant weight and lusciousness to the fish, and, combined with the dressing, made the branzino sit heavy on the palate. I really would've liked more brightness, more acidity to the dish to balance things out. 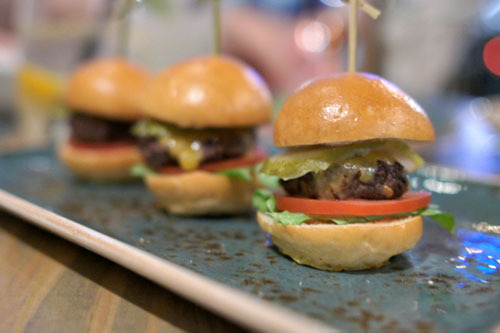 The sliders were arguably the smallest I've seen, though rather tasty (I would have no problem popping a few of these during a meal). They were classic in presentation, with traditional ingredients and a nicely charred, beefy patty and a delightfully tangy crunch from the pickle. 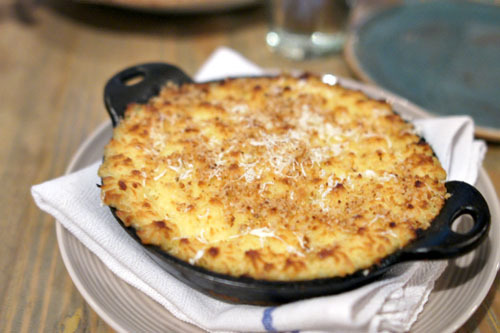 A side of macaroni and cheese was excellent. The pasta showed off just the right texture--supple, yet with a good bite--and I loved the crunchy bits on top. The integration of the cheese with the subtle hints of truffle was spot on as well, and I really enjoyed the light, bright counterpoint provided by the peas. Our second round of cocktails brought us the Brown Cow, which, according to one of my dining companions, had an almost suanmei-esque kick to it, with a distinct tart fruitiness playing off of the rum. The Perfect 10, meanwhile, was too sweet for my liking, with its sugary, candied character that actually recalled the taste of Skittles. Here was a very traditional shepherd's pie, basically a type of meat pie filled with lamb and topped with a mashed potato crust. We're talking "meat & potatoes" here, and the dish was all that you'd expect: hearty, filling, and comforting, with the tender, richly-flavored meat melding well with the comparatively mild potato. Next was a quintessential preparation of fish and chips. Made with the traditional choice of cod, the fish was on point, nicely moist, flaky, and delicately saline on the inside, with a lovely, golden crust to boot. The paired tartar sauce worked beautifully here, though I would've liked a bit more crispness on the fries. The restaurant features a number of pizzas on the menu, so naturally we had to give one a go. Our server recommended this particular pie, and though it was a touch on the saccharine side for me, I still enjoyed it. 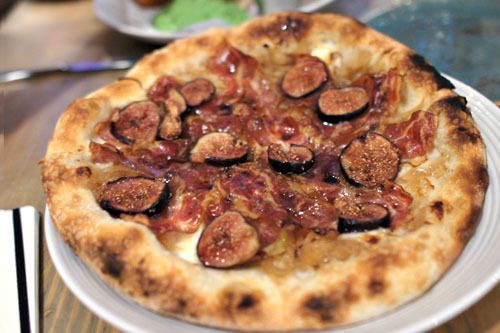 The sweetness came from both the caramelized onions and the figs, with those two elements serving as a fitting contrast to the savory meat. The crust was also quite nice, with a pleasing crunch and great hint of char bitterness. 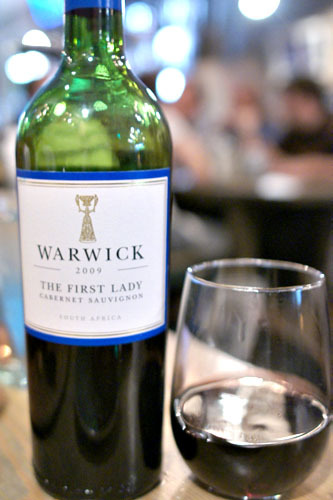 For our heavier beef courses to follow, we ordered up a bottle of the Warwick "First Lady" Cabernet Sauvignon 2009, South Africa [$43]. It was a solid Cab, with pretty much everything in place, though it did come off as particularly spicy. 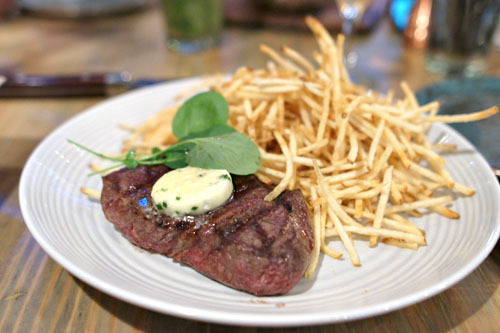 A flat iron was served sous vide, making for a surprisingly tender, delicately-flavored steak. The compound butter was aptly incorporated here, adding a well-placed touch of saltiness to the dish. I also appreciated the huge mound of matchstick fries, too. The long rib was appropriately massive, and a bit intimidating. 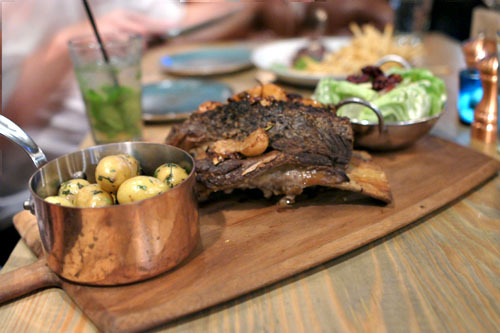 Fortunately though, the meat was falling-off-the-bone tender, heavy, and unapologetically rich, with the crust contributing a countervailing astringency to the beef, as well as a hint of what tasted like lemongrass. The minted fingerlings were fitting accoutrements to the rib, but I wasn't as crazy about the Waldorf, which seemed too weighty and substantial--I wanted something brighter, more acidic to cut the fat of the meat. Our first dessert came as a recommendation from our server, and it was as delicious as you'd expect, with a deft interplay between sweet and nutty flavors and a lovely mélange of disparate textures. 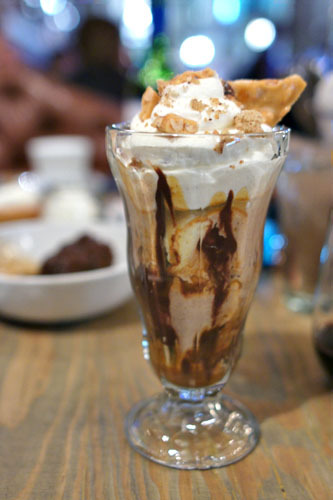 Next was The Fat Cow's version of a classic English dessert. 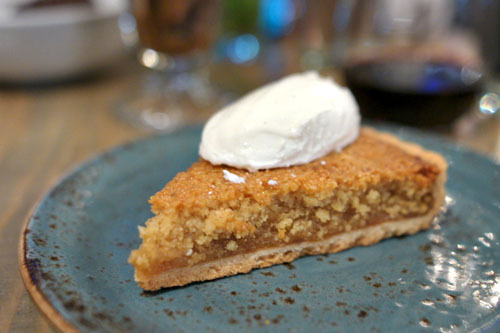 I rather liked it, finding the sweet, fruity, jammy treacle (a sugar syrup) a good match against the dense pastry. 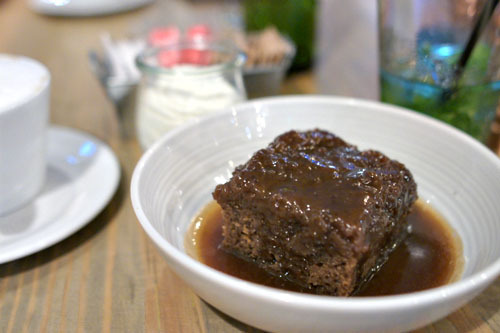 We closed with a sticky toffee pudding. Though not quite up to the lofty level of the one at Gordon Ramsay Steak, it was still nonetheless quite delectable, with the dense, decadent cake conveying deep, dark, sugary notes that we all enjoyed. 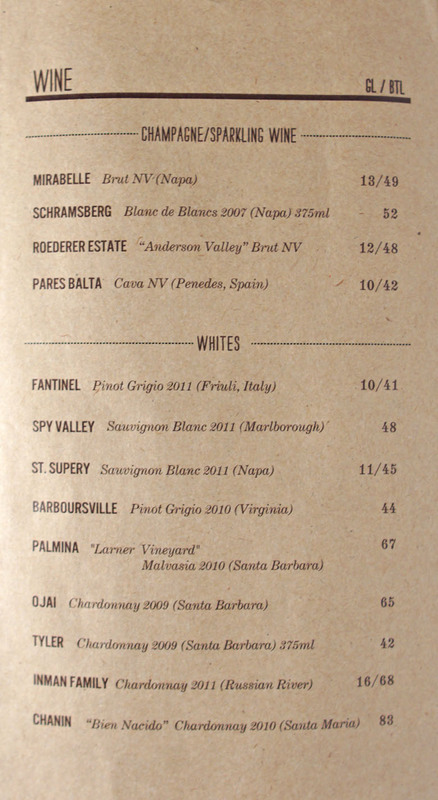 I'd love to see this paired with some ice cream (brown butter perhaps?). According to press materials, Ramsay's idea here was to have an uncomplicated, "neighborhood restaurant" type of place. In that regard, The Fat Cow appears to be mostly successful, serving up comfortable, cozy dishes that, for the most part, satisfy (though there are a few tweaks that I'd like to witness). I think it's a fitting concept for The Grove that'll do well. However, at the same time, I really would like to see the kitchen stretch a bit more, play it a bit less conservative with some of the dishes, and perhaps show us some of the haute, three-star flair that made Gordo famous in the first place. 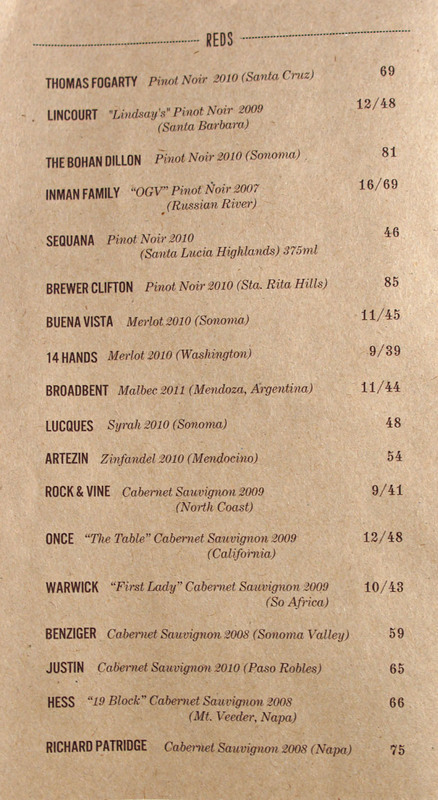 Looks like there are some minor mistakes on the beer list. You'd think a well backed establishment like this would get their menus edited properly. 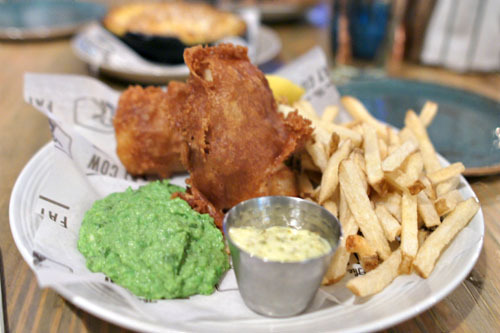 Are those smashed peas on the fish and chips plate? Went there for lunch and had the burger. Quite good but not best-in-LA worthy. I'll be back to try more of the menu, especially the salads sourced from Farmers Market veggies a few hundred feet away and the heartier beef and British dishes. Correct you are sir. Additionally Hoegaardan is a witbier and not a hefeweizen. What can I say? I am a fan of the site and of beer. I didn't realize that there was a restaurant named after one of my ex-girlfriends! I've been excited about this place, but I don't know any more. The word gastro"pub" carries a meaning. 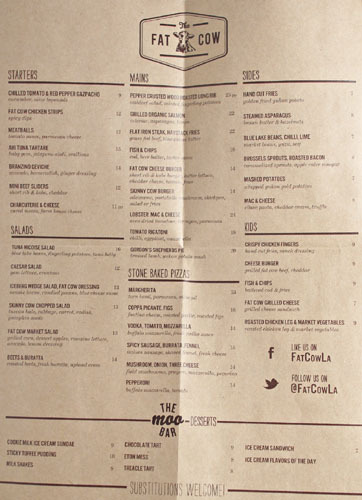 This is just about the saddest beer/drink menu I've seen in California since the late 90s. 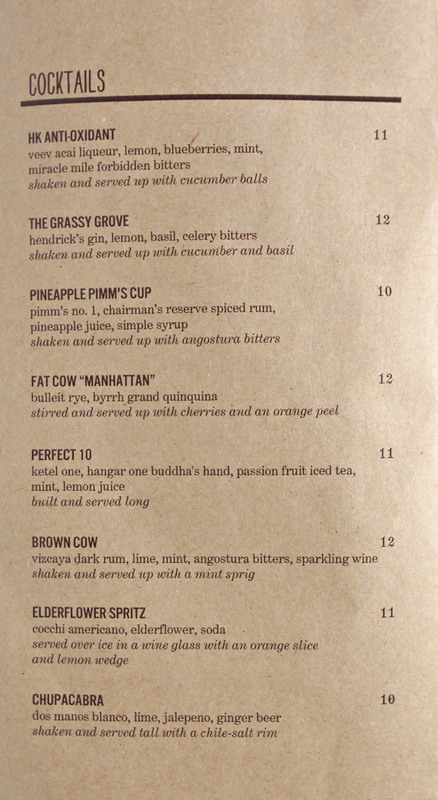 1 minute walking distance away is Short Order, whose bar selection puts this sorry concoction of trite minutiae to shame. sygyzy: Mushy peas, a traditional accompaniment to fish 'n' chips. JG: Did you make it back yet? Also, out of curiousity, what is the best burger? 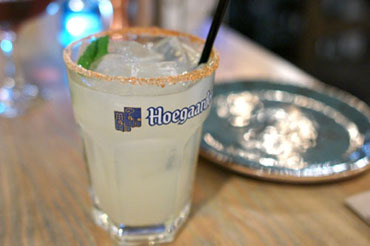 Vinh: Ahh, another good catch about the Hoegaarden. 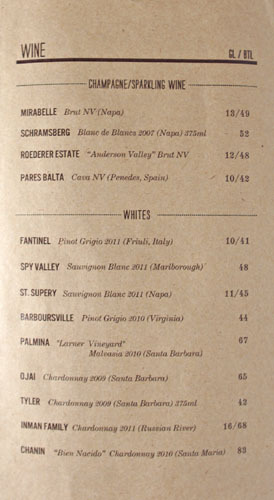 Given that I was in a cocktail mood, I barely even glanced at the beer list at the restaurant--I should have. Nicko: I definitely hear where you're coming from. 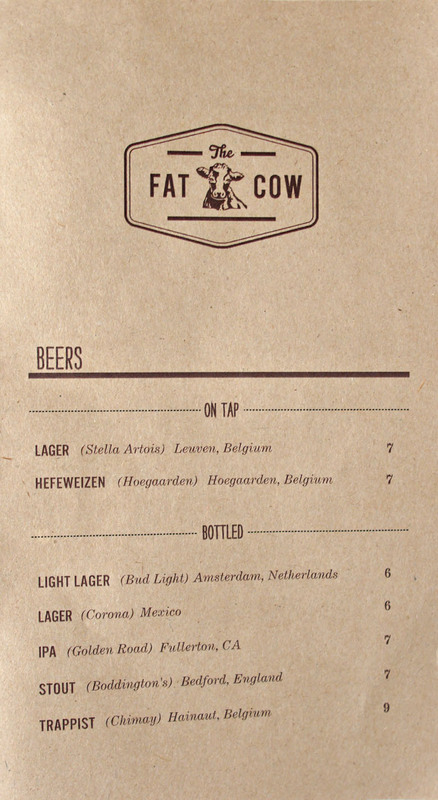 Though Fat Cow was initially billed as a gastropub, I think they're actively trying to move away from that descriptor, as evinced in the short beer list.